Rafael Benitez believes Newcastle United’s Jonjo Shelvey is the man to solve England’s creative problems in midfield. 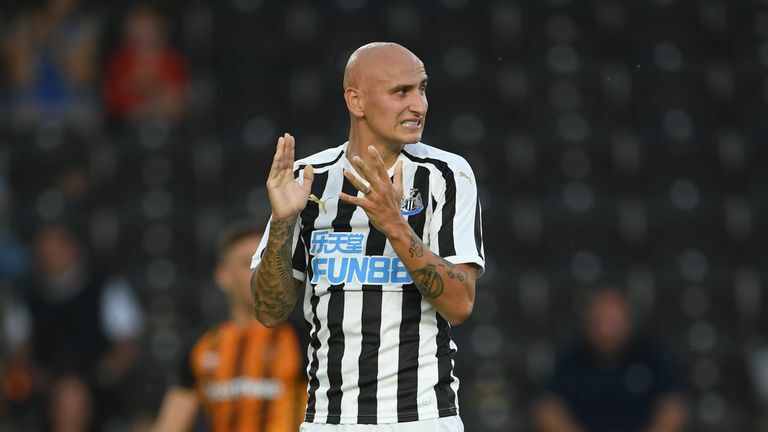 Shelvey was left out of Gareth Southgate's World Cup squad despite calls for his inclusion after a strong season with Newcastle, and he admitted last month "it was "hard to sit there and watch" as England reached the semi-finals. However, England's struggles in midfield in last week's 2-1 defeat to Spain have prompted some to urge Southgate to rethink his options in the centre of the park, and Benitez has urged him to look hard at Shelvey. When asked if Shelvey is good enough for England, Benitez replied: "For me, yes, for sure. He has the quality, he has the vision and he can make the passes that the strikers like, in behind the defenders and things like that. "But especially because, in a squad, you have to have different kinds of players. I don't see too many like Jonjo in the team. "Southgate is the manager. He has to decide. I am the manager of Newcastle United. Shelvey is my player. "Can he play for England? Yes." Newcastle currently sit 18th in the Premier League table after losing three of their opening four matches to Tottenham, Chelsea and Manchester City, while drawing with Cardiff City. The Magpies will face another difficult test on Saturday when Unai Emery's Arsenal visit St James' Park. Shelvey has missed time with a thigh injury but has returned to training and is in contention to play this weekend, as is winger Matt Ritchie, who has recovered from a knee injury. PL questions: Kane to find form? Benitez said: "We have Shelvey and Ritchie training. So, no big issues. Everybody was training so we have to decide now who can play and who cannot. "But both Ritchie and Shelvey are in the squad."